I’m getting close to finishing my recap of our Cuba trip. This post and one more, I think, will do it. Rick and I are fairly new to foreign travel. Our first two trips were with the Missouri Botanical Garden‘s director, Peter Wyse Jackson. When we made our plans to go to Cuba we asked Dr. Wyse Jackson if there was anything we could do for him there. He asked us to visit the Jardín Botánico Nacional de Cuba (National Botanical Garden of Cuba) in Havana and to issue an invitation to the new director there to visit St. Louis. Our tour guide in Cuba, Christopher, was able to arrange a taxi driver to spend the day with us. Christopher also called the director’s office to let her know, in Spanish, that we were on our way. 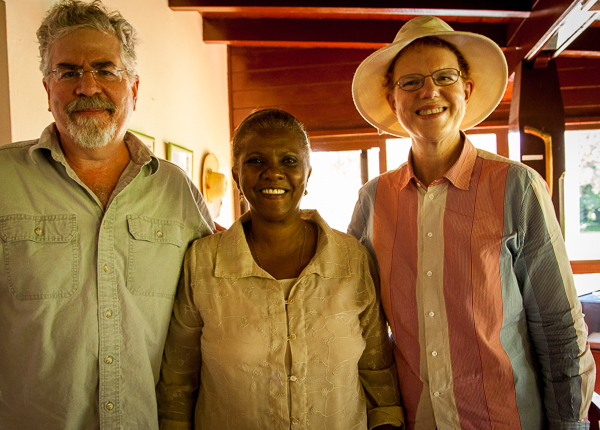 The director arranged for the garden’s English-speaking guide, Ana Maria, to spend the day with us. Here, Ana Maria is showing us the greenhouses. In Cuba, they have plenty of heat, so the greenhouses have roofs but no walls. In order to grow desert plants, they need the roof to keep the rain off so they can control the amount of water the plants get. Another set of greenhouses are covered with thick netting to make it possible for the Garden to grow more temperate plants that can’t handle the heat and sun in Cuba. This garden is enormous! To see it, you have to take advantage of the transportation — a long bus-like carriage pulled by a tractor. They have several interesting collections including one of the world’s largest collections of palm trees and a display of serpentine plants,(yeah, I had to look that up when Dr. Wyse Jackson told us about them), including many rare and endangered specimens. We’re still hoping to see Dr. Monterrey again in St. Louis, but it’s a complicated process to get her here. That’s really interesting! I’ve never showed much interest in plants before- but facts like that make me realize that everything can be interesting. Fascinating! Sounds like you had a memorable trip. Have you ever been to Fairchild Tropical Gardens in Miami? It has a huge collection of palms, as well as other tropical plants. 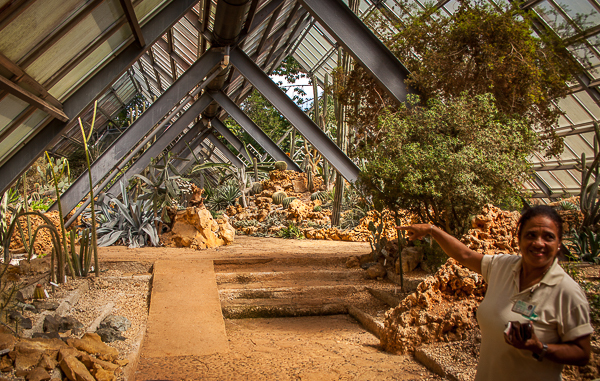 If you love plants, it’s worth a trip. What a greenhouse! Sounds like you had a great time! sharing your trip. Have a great day! The posts were so interesting and glad I had a chance to read them. Cuba is on my itinerary very soon and your photos have helped me add to our must see’s. This looks and sounds like a wonderful place to spend some time. Beautiful – your trip just sounds so amazing! You are very lucky to be among the first Americans to visit Cuba in so many years! Thanks for sharing your experiences. That is an amazing greenhouse! I would show the picture to my husband, who is saying he is going to make a greenhouse, but I’m afraid it would inspire him TOO much!